Bright, shiny brass fixtures may not be your idea of the ultimate modern decor. Instead of buying new light fixtures, hardware or other home accessories, consider painting the brass into oil rubbed bronze. Oil rubbed bronze is a deep, chocolate brown with metallic tones and highlights. The finish is popular in many homes. The project takes a few hours, plus dry time. 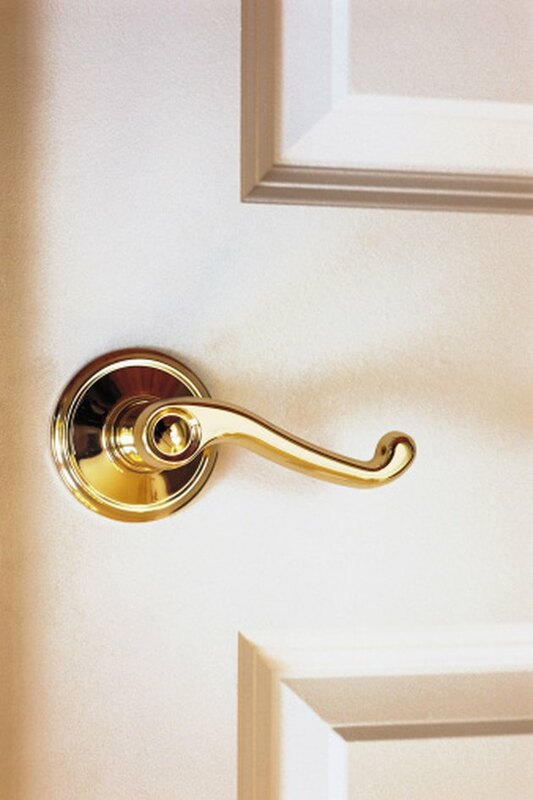 Outdated brass accessories may be changed with a little paint. Prep your item for paint by cleaning the entire piece well. Wash with a soft sponge, and warm soap and water. Use toothpicks, cotton swabs or other small tools to remove dirt from corners. Wipe the accessory dry. Rub the brass piece with lightweight sandpaper or a sanding block. Do not apply hard pressure because this will create unwanted crevices and scratches. Simply sand to create a slight rough surface for the paint to grasp onto. Wipe away any dust or brass specks with a damp cloth. Place your brass item into a large cardboard box, on top of a drop cloth or other protective area. Work outside, if possible, to avoid paint fumes. Shake a can of black spray paint for about 20 seconds. Press down on the nozzle while holding the can about 6 inches from the surface. Lightly spray the entire piece. If you cannot cover the entire item in one coat, return in about an hour and repeat the process. Allow to fully dry. Pour a small amount of bronze paint into a paint tray or palette. Dampen a sea sponge, chip brush or rag. Using your tool, apply the paint to the fixture. Dab the paint randomly over the black paint. Cover all the black paint so it is no longer visible. Use a small artist brush to paint small corners and crevices. Allow paint to dry about two hours. Mix together one part black paint with two parts clear glaze in a small container. Stir well. Use the damp sea sponge and dab on the glaze mixture randomly over the bronze paint. The glaze will antique the metallic bronze color and give depth to your accessory. Allow the glaze to dry about 24 to 48 hours. Spray your accessory with water-based polyurethane for additional protection. Use a spray paint and apply in the same manner as the original black base coat. Add more layers for additional protection. Allow to dry 24 to 48 hours.